Jehu Jones Sr. was a free black entrepreneur in Charleston, South Carolina, most well known for owning the Jones Hotel. He was born in 1769 as a slave to Christopher Rogers, a tailor, and grew up learning his master’s trade. Rogers manumitted (freed) Jones in 1798 for $140.00, and soon thereafter Jones set up his own tailoring shop. Even though he often ran into problems trying to collect money owed him by his white patrons, Jones could, under South Carolina law, file lawsuits against them. Jones’ shop proved successful, and with the help of his eldest son, Jehu Jr., he expanded the business. 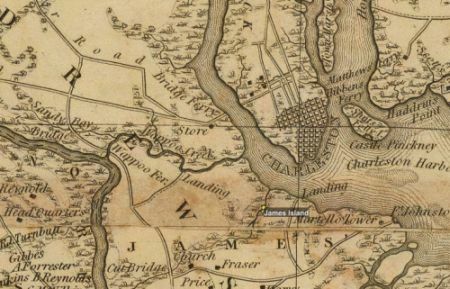 In 1802 Jones started investing in real estate in Charleston and in the nearby town of Sullivan’s Island. As Jones’ investments grew in value he began purchasing slaves in 1807. In 1809 Jones purchased from William Johnson a house and plot of land on Broad Street, behind St. Michael’s Church. In 1815 Jones bought another property called The Burrows-Hall House, at 33 Broad Street, for $13,000, and in 1816 he sold the Johnson House to St. Michael’s Church. When Jones took up innkeeping, he passed on his tailoring business to his son, Jehu Jr. Jones and his wife, Abigail, turned the property on Broad St. into the Jones Hotel, which became a popular stop for travelers. Jones proudly displayed the portrait of Samuel F.B. Morse, one of his guests. Most patrons of the Jones Hotel were wealthy whites who praised the hotel and its owners for its comfort and fine food. Jones and his wife in turn prospered and became part of the wealthy elite free blacks in Charleston. Jones became a member of the Brown Fellowship Society, a prestigious organization in Charleston. The Denmark Vesey Conspiracy of 1822 influenced the South Carolina General Assembly to pass laws to closely monitor free blacks. One of the laws passed in 1822 called for every free black male over fifteen years old to be assisted by a white guardian. Another law in 1823 prevented free blacks from returning if they left the state, a law that prevented Abigail Jones from returning to South Carolina after taking her children and grandchildren to New York for a visit prior to the Vesey Rebellion. Jones, along with his guardian, Governor John Lide Wilson, petitioned the Assembly for a leave of absence from the state so that Jones could visit his own family. The petition was granted and Jones saw his family, but could not return to the state. In 1827 he requested permission to visit his family in St. Augustine, Florida, but the records are unclear as to whether he made the trip or not. There was a rumor circulating that Jones moved to New York and walked the streets disguised as a woman. Abigail never returned to South Carolina and stayed in New York as an innkeeper. She died before her husband. Jones died in 1833, leaving behind an estate worth about $40,000 to his three sons and his stepdaughter, Ann Deas. Deas returned to Charleston and obtained a pardon from the governor for leaving the state without permission. Deas and Eliza A.
Johnson, another free black Charlestonian then purchased the “Jones Establishment.” They reopened the hotel as an inn in 1834, and Deas ran it until she sold it in 1847.